Most prospects sheepishly acknowledge that they don’t have a formal Marketing Plan. This group earns big points with us for honesty. Some less forthright prospects will claim they do have a Marketing Plan, but when asked to show it to us, this group responds with, “Our plan isn’t written down,” or “It’s being updated,” which really means that they don’t have a plan. · It’s too much work to create and maintain a Marketing Plan. · We had a Marketing Plan once, and it just sat in a 3-ring binder on the shelf. · Senior management doesn’t understand marketing. Why confuse them more? · It’s easier to just keep trying different marketing tactics, to see what works. After decades of watching companies either earnestly struggle to create a Marketing Plan, or strenuously avoid creating one, we recently had an epiphany. We realized that most companies should SKIP the Marketing Plan altogether. Step 1: Determine why customers should buy your product / service. This seemingly simple goal – to understand what’s special about your company – is the most essential element of marketing strategy. Many companies either don’t have a clue, or have an unfounded / unrealistic viewpoint on why people should do business with them. You need to nail this step. Step 2: Learn why customers are buying from your competitors. To gain a reliable answer to the Step 1 question, you need to possess a thorough understanding of the competitive landscape. The most successful marketers know everything about (and closely monitor) current competitors, to gain insight into why customers buy from them. They also work to anticipate new competitors, and explore potential customer solutions that could disrupt the entire category. Step 3: Learn what your customers want and don’t want. If you’re not having a continuous, two-way conversation with current, prospective and former customers, then you are flying by the seat of your pants, marketing-wise. And you can’t rely exclusively on surveys to gain that market intelligence. Pick up the phone and talk to decision-makers at least once a quarter to really understand what they think and what they need. Step 1: Define what your marketing resources are. Marketing requires money and people. Work backwards to build a marketing strategy. First decide what resources are available to invest, and then determine what strategies / tactics you can afford to apply properly and consistently. Having an “open budget” for marketing makes you a target for the latest gimmick, and is a sure way to waste a boatload of money. Step 2: Put your sales process under the microscope. Marketing is not a religion. To justify its existence as a corporate function, marketing must help produce tangible business outcomes. Most marketing activity should be related to sales…and the sales function requires close scrutiny in advance of any marketing investment. If your sales process is broken (or non-existent), then your marketing will likely yield nothing of value. Step 3: Define exactly what you want your marketing to achieve. Your marketing goals should be directly or indirectly connected to activity that drives revenue. If that revenue connection is fuzzy, or based largely on wishful thinking, then either refine or eliminate the weak strategies and tactics. Be ruthless in your evaluation of all marketing activity at all times. Step 1: Select one effective direct marketing tactic. Most email solicitations go unread, with good reason: they are self-serving, poorly written and lack a compelling rationale for people to respond. But because the email marketing bar is so low, there is plenty of opportunity to stand out from the crowd. There’s also a big opportunity to leverage traditional snail mail, largely because marketers have abandoned that channel in lemming-like fashion. Step 2: Select one smart content marketing tactic. 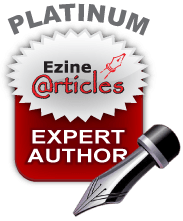 The objective is to showcase your company’s intellectual capital (which is very different from a sales pitch), either through respected print / electronic media sources or social media, primarily to gain online visibility for that content. The 2016 marketing reality is this: If potential clients can’t find you by searching online, then you are not in the game. If you prefer to stick with the “We’re a relationship business, and don’t need an online brand presence.” marketing approach, then please let me know. I would like to short your stock. Step 3: Select one consistent tactic to keep in touch with clients, prospects and referral sources. With so much media noise and competition, and because you can never know when people will be ready to engage, it’s important to remind decision-makers that your company is ready to help them. Quarterly communication is sufficient, and will avoid being viewed as a pest. Standard “all about us” newsletters are boring, so provide content that’s meaningful and of interest to your readers. This overly simplistic, 9-step planning process is unlikely to gain the endorsement of the American Marketing Association. But for the vast majority of businesses who don’t have the time or interest to create a bona fide Marketing Plan, this “Easy-Bake Marketing Cake Recipe” should more than suffice. Compared with some of the overly ambitious, non-productive Marketing Plans that we’ve seen over the years, it’s also likely to produce a much tastier outcome. Bon appetit. Time to temper our love affair with pixels on a screen? In a pre-pixilated world in the not too distant past, Ink on Paper ruled the world of marketing. Capabilities brochures, annual reports and other print collateral – complete with blind-embossing, foil-stamping, perfect binding, die-cutting and spot-varnished photos – served to explain, sell and educate. Graphic designers used drafting boards, rulers and glue. They understood the difference between a sheet-fed and web offset printing press, could distinguish between thermography and engraving, and spent hours studying paper stock samples, typefaces and PMS color charts. In the days of Ink on Paper, marketers reviewed press proofs; they hand-delivered advance copies of newly printed materials to their CEOs, and measured ROI based on Business Reply Card volume. Printed words and images did not move on the page. Content stood on its own, linked to nothing. And the US Postal Service was profitable. There’s no denying the time and cost efficiencies of our online world. We now communicate more broadly, more precisely, more rapidly and with greater marketing insight than we could ever have imagined 20 years ago. Visceral Impact – Pixels on a screen have no weight, no dimension, no texture, no smell. Ink on Paper places something physical into a person’s hands. They open the cover and turn its pages. They can scribble notes in the margin, or rip out a photo. It’s a sensory experience that communicates on human terms, and that cannot be replicated by a PDF downloaded and created on a laser copier. Personality – The range of creative expression using pixels is limited by the fixed dimensions of a flat glass screen. Ink on Paper lives on a canvas of unlimited graphic possibilities, in terms of size, shape, color and physical features. No scrolling is required to appreciate the design. It provides an opportunity to stand out from the crowd, to express yourself more effectively, and to make an impression that’s likely to be remembered. Permanence – People scroll through computer screens at hyper-speed. The volume of information is unlimited, and no intellectual commitment is required of viewers. Ink on Paper moves in slow motion, forcing readers to pay closer attention to its content. Print materials possess presence and permanence, suggesting that the people and company who produced them actually exist, have nothing to hide and can be trusted. Craftsmen in any field are quick to embrace new tools and methods that enhance their results and professional satisfaction. They also understand the importance of sticking with tactics that work well. Seasoned marketers who have thrown the baby out with the bathwater in their rush to digital communications, as well as more recent arrivals to the marketing profession who have always lived in a paperless world, would be well served to reconsider Ink on Paper as a medium. No marketing communications program is truly integrated without that capability. LtoR: Heather Fuller, Andrew Crisp, Percy, Gary Thompson, Mickie Kennedy. Missing: Nimmi, the acrobatic dog. eReleases competes with dozens of electronic news distribution services, all seeking to charge companies and PR agencies hefty fees to put their press releases in front of journalists, in hopes of capturing the media’s attention and coverage. After some polite online badgering by eReleases, Highlander Consulting gave that upstart firm a shot last week; tasking them to distribute a press release for one of its clients, CAP Index Inc. – a leading provider of crime forecasting data and risk analytics. 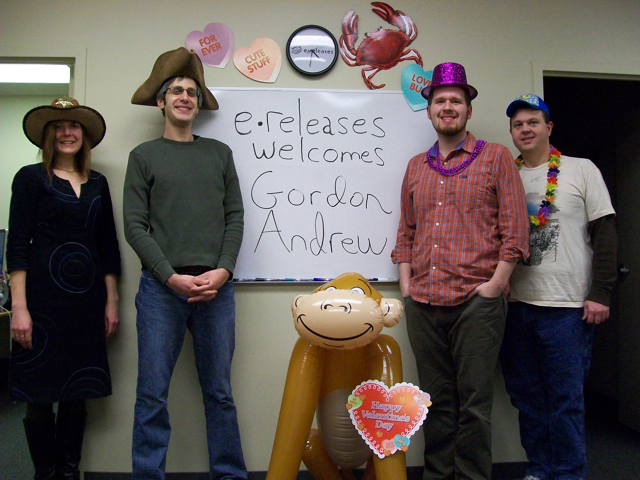 eReleases’ results were as good as, or better than, any of its larger, better-known competitors. But what impressed us more than the quality of their service, was the no-cost, cornball guerilla (included in photo) marketing tactic that eReleases applied to thank us for our business. So….what service provider will Highlander think of FIRST the next time we need to distribute a press release online? Marketing Lesson: Cheap, clever and memorable can beat costly and sophisticated when it comes to driving top-of-mind awareness with targeted B2B audiences.